Trust is an essential element in all healthy relationships, and the relationships that exist in your school are no different. How can your school leaders or teachers cultivate trust? How can your institution maintain trust once it is established? 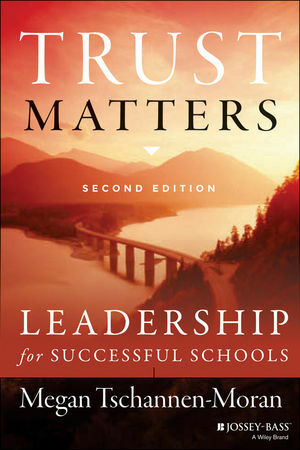 These are the questions addressed and answered in Trust Matters: Leadership for Successful Schools, 2nd Edition. The book delves into the helpful research that has been conducted on the topic of trust in school. Although rich with research data, Trust Matters also contains practical advice and strategies ready to be implemented. This second edition expands upon the role of trust between teachers and students, teachers and administrators, and schools and families. With suspicion being the new norm within schools today, Trust Matters is the book your school needs to help it rise above. It shows just how much trust matters in all school relationships—administrator to teacher; teacher to student; school to family—and in all successful institutions. MEGAN TSCHANNEN-MORAN is a professor of educational policy, planning, and leadership at the College of William and Mary’s School of Education. She has written several pieces on trust, including the successful first edition of Trust Matters, and is considered a leading scholar on the subject of trust in educational settings. She is the coauthor of Evocative Coaching: Transforming Schools One Conversation at a Time.